We still have to wait a few more weeks to play Mario Kart 8, but here's something to help tide us all over until the game finally launches at the end of May. If you go over to Nintendo's main Mario Kart 8 website, you can spend the rest of your Friday listening to the game's excellent soundtrack. Here's hoping that Nintendo turns it into a playlist for YouTube or Spotify. Nintendo hasn't been shy about just how proud they are of this soundtrack. Last month when I wrote about speaking to Nintendo about Mario Kart 8, I mentioned that Kosuke Yabuki and Hideki Kono stopped short of answering my last question to give a "brief advertisement" for the music in the game. 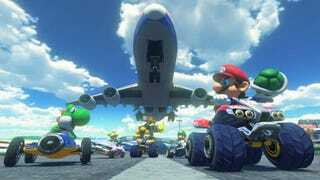 They wanted to emphasize that "more than half" of the tracks created for the upcoming Wii U title were recorded in a studio with real live instrumentation. I was more than a little annoyed about being cut off. But I hadn't listened to the full thing yet. Now, I understand why they felt the need to reserve themselves some bragging rights. Seriously, give this thing a listen. It's amazing.